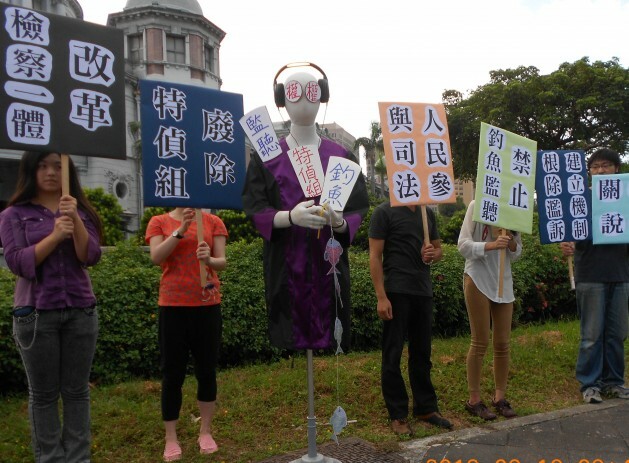 Members of Taiwan’s Judicial Reform Foundation at a protest in Taipei against surveillance of citizens. Credit: Dennis Engbarth/IPS. TAIPEI, Mar 3 2014 (IPS) - Taiwan’s national legislature has taken a small but important step to curb rampant government surveillance of citizens and politicians through revisions of the Communication Security and Surveillance Act and the criminal code. The changes were sparked by a political furore last September involving wiretaps against the speaker of the national legislature and other leading lawmakers by a secretive Special Investigation Unit (SIU) under Supreme Public Prosecutor Huang Shih-ming. “These figures show that either Taiwan is a paradise for criminals or that there is gross abuse of wiretapping." At a high profile news conference Sep. 6, Huang had waved transcripts of wiretaps said to show that legislative speaker Wang Jin-pyng had pressured justice ministry officials not to appeal a court judgement on opposition Democratic Progressive Party legislative caucus convenor Ker Chien-ming. The supreme public prosecutor declared that the wiretaps had discovered “the greatest influence peddling scandal in history,” even though prosecutors failed to indict any lawmaker. President Ma Ying-jeou, who is also chairman of the ruling Chinese Nationalist Party (Kuomintang or KMT), attempted to use the flap to force Wang out of the ruling party and out of office. However, courts granted Wang an injunction against his expulsion from the KMT and he still retains his office. An investigative report released Jan. 15 by the Control Yuan, the ombudsman branch of Taiwan’s government, confirmed that the supreme public prosecutor had abused his powers in ordering the SIU to carry out “multiple investigations in one case”, or “fishing”, and unauthorised surveillance on lawmakers. “The September storm triggered a backlash over the virtually uncontrolled criminal surveillance by the prosecutors, investigators and police,” Judicial Reform Foundation board member Kao Yung-cheng told IPS. Citing Ministry of Justice figures, Kao said that prosecutors had applied for an annual average of 15,312 wiretaps between 2008-2012, 74 percent of which were approved by courts. Comparatively, wiretapping requests over the period averaged 2,720 cases annually in the United States, which has a population 11 times that of Taiwan. “These figures show that either Taiwan is a paradise for criminals or that there is gross abuse of wiretapping and disproportionate invasions of privacy by judicial and law enforcement agencies,” said Kao. Opposition attempts to force Huang’s resignation and disband the SIU ultimately failed, but cooperation between opposition lawmakers and KMT legislators associated with Wang, and intense pressure from legal reform and human rights organisations led to passage Jan. 15 of revisions to the Communication Security and Surveillance Act (CSSA) to restrict the use of wiretaps. President Ma, whose disapproval rating soared to over 75 percent in the wake of the scandal, promulgated the revisions Jan. 29. “The most important change is the requirement that prosecutors must submit separate applications for warrants for approval by courts for each person to be wiretapped instead of giving prosecutors a virtual blank cheque,” DPP legislator Yu Mei-nu, a long-time human rights and feminist lawyer told IPS. The revisions also require judges to reject applications by prosecutors for wiretaps that are not in keeping with legal procedures, lack sufficient reason and are unclear or insufficient in their explanation. Moreover, prosecutors will not be permitted to review communication records of persons suspected of offences that carry minimum sentences of less than three years. Approval by a judge will be required for all such applications except for some serious felonies with minimum sentences of at least 10 years, such as kidnapping, human trafficking, fraud or intimidation. Moreover, courts will now be required to officially notify the person who is wiretapped within 14 days after the conclusion of the surveillance. A revamped act also establishes a legal channel for appeal by victims of illegal wiretapping. The Ministry of Justice will also be required to publicly issue an annual report of wiretapping, and report relevant data to the legislature. Judges or prosecutors who violate the rules could face legal review or discipline, while civil service officials or employees who misuse material from wiretaps could face sentences of up to three years. However, the reform push failed to achieve two major objectives set by human rights groups. “The best way to prevent excessive tapping and interference with privacy is to have officers listen on site in real time and not just record and store everything for prosecutors to listen to at their leisure, but this proposal did not pass,” Kao said. Also rejected were proposals to disband two centralised surveillance centres operated by the Ministry of Justice Investigation Bureau and the National Police Administration. “These amendments do constitute a small positive step, but even bigger steps are needed to really curb wiretapping abuse,” the DPP’s Yu Mei-nu told IPS.